Yet another new race of downy mildew (Peronospora farinosa f. sp. 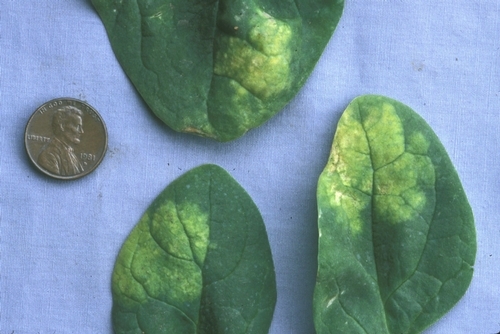 spinaciae) on spinach has been identified in California’s Salinas Valley. The type, or original, strain was initially designated as UA2209 and was first detected in May 2009. Subsequently, it was found in an increasing number of locations throughout California in 2009 and 2010. This race breaks the resistance of several important cultivars. The race has been characterized on a set of differential cultivars and was designated as race Pfs 12 by the International Working Group on Peronospora (IWGP). The working group is located in the Netherlands and is administered by Plantum NL. Race Pfs 12 poses a threat to the spinach industry because it is particularly well-adapted to most modern hybrids with resistance to race 1-11, which have been widely planted in the past few years. Race 12 is distinct from race 11 because of its virulence on the differentials Campania and Avenger. The appearance of a new race is not completely unexpected because hybrids with resistance to races 1-11 have been planted on a large scale. Similar developments have taken place when races Pfs 5 (1996), Pfs 6 (1998), Pfs 7 (1999), Pfs 8 and 10 (2004), and Pfs 11 (2009) were identified and named. The occurrence of Pfs 12 will create strong interest for Pfs 1-12 resistant spinach cultivars from both growers and breeders. The IWGP is a working group of Plantum NL consisting of spinach seed companies (Pop Vriend, Monsanto, Rijk Zwaan, Nunhems, Takii, Sakata, Bejo, Enza, Syngenta, Advanseed), Naktuinbouw, and the University of Arkansas. The efforts of the group are supported by research activities at the University of Arkansas and the University of California Cooperative Extension—Monterey County. 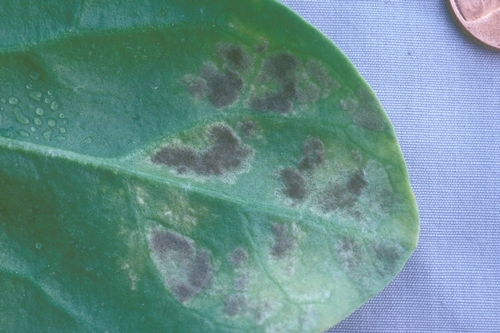 The aim of the IWGP is to monitor and designate new races of downy mildew in spinach, and to promote a consistent and clear communication between the seed industry, researchers, and growers about all resistance-breaking races that are persistent enough to survive over several years, occur in a wide area, and cause a significant economic impact. IWGP is monitoring new races continuously by testing field isolates on a fixed, common host differential set of cultivars that contains the full range of available resistances. Researchers all over the world are invited to join the IWGP initiative and use the common host differential set to identify new isolates. For California, the Correll-Koike team will continue to receive and test spinach downy mildew samples for growers, pest control advisors, and seed companies. For more information on this subject you can contact Steven Koike (stkoike@ucdavis.edu), Jim Correll (jcorrell@uark.edu), Diederik Smilde (d.smilde@naktuinbouw.nl), or IWGP chairperson Jan de Visser (JandeVisser@popvriend.nl). Downy mildew is the most damaging disease of spinach in California and causes yellow and tan leaf lesions. 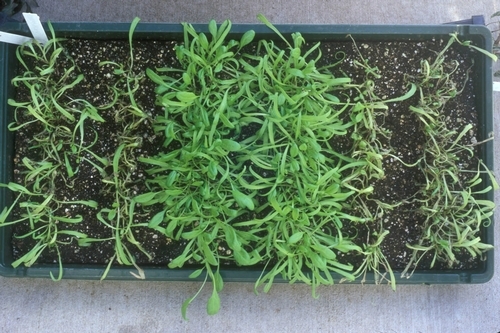 To identify downy mildew races, a series of spinach cultivars is grown and inoculated; races are identified based on which cultivars become diseased.